Sometimes you win, sometimes you lose, and sometimes you’re standing there holding the championship trophy and you’re really note sure how or why. 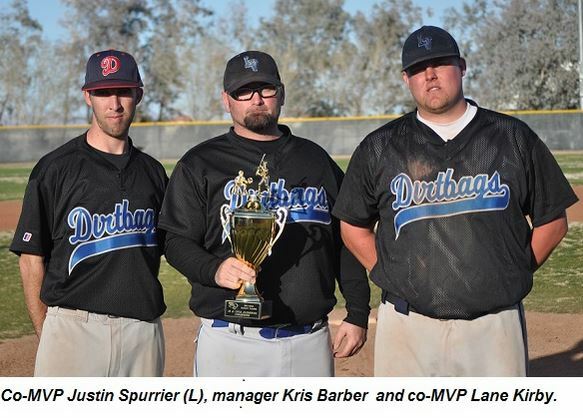 Las Vegas Dirtbags skipper Kris Barber fit snugly into the third category following his team’s 16-4 win over the OC Sox in the 18 Aluminum Bat finals at the 2013 Kickoff Classic. Barber was candid about his team’s performance in the early season tournament. The Dirtbags were 4-1 in the tournament – not a bad record. They won their opener 10-8, and then lost to the Bears 20-11 before shellacking the Chicago Sidewinders 16-0 in the last round robin game. Whatever flaws existed were whitewashed during a 20-hit onslaught in the finals. Mike Villa’s fifth inning homer, which bounced off the left field light standard and back onto the field, highlighted the Dirtbags’ 20-hit attack. Villa finished with two hits on the day. Jason Wiltshire had three hits and walked twice. Barber notched four hits, all singles, and two RBI, and Justin Cliff, subbing for Spurrier on offense, had three hits and two RBI. Dirtbag starter Justin Spurrier allowed three runs in the first two frames, but held the Bears to just one more run through six complete innings. Paul Schmidt struck out four and allowed no runs in the final three frames for the save. Bears’ starter Daniel Cardinas took the loss for the Bears, but exacted a small slice of revenge with a solo homer on the first pitch from Spurrier in the sixth inning. It was the Bears final run of the game. Matt Villalobos and Steven Guerrero also threw for the Bears. The Bears led 3-0 after two innings. Guerrero had two hits in four trips for the Bears. James Dorsy had three hits on the day. The Dirtbags named Spurrier and Lane Kirby as their tournament MVP’s for their offensive and defensive efforts.